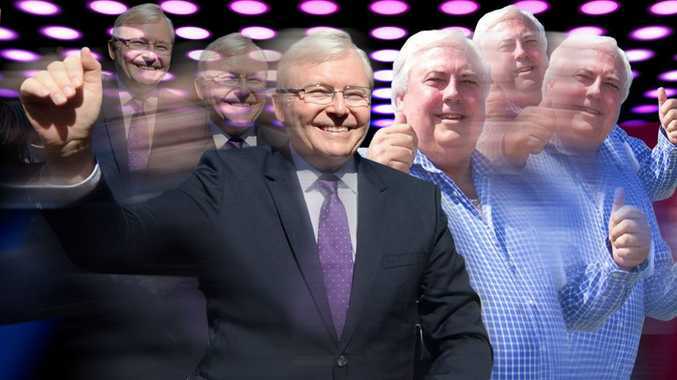 CLIVE Palmer has challenged Kevin Rudd to a dance off, saying if the Prime Minister was not going to debate Mr Palmer, they may as well give voters a bit of fun. But the man who wants to be PM was no mood for fun when questioned on ABC radio in Melbourne over the background of two of his candidates. The mining magnate was asked why he was running two senate candidates in Victoria, Barry Michaels and Doug Hawkins, who had "been to court in relation to allegations of violence against women". The allegations were more than 10 years old. ''Well of course that's not true,'' Mr Palmer replied, saying that neither man had been convicted. But the interviewer, ABC 774 host Jon Faine, pushed the issue, saying they were not of substance enough to result in intervention orders. ''Look I can bring a charge against you for being a deadbeat,'' Mr Palmer said. ''They haven't been convicted of anything. They weren't true, the allegations weren't true,'' Mr Palmer said. ''Why don't you talk about policy? Why don't you talk about reducing the pensions? Mr Palmer then said ''goodbye'' and hung up. Fairfax reports that several callers lashed Faine for focusing on the past and failing to ask Mr Palmer about his policies. Mr Hawkins, a renowned Australian football identity, notched up more than 300 games for Footscray Football Club during the 1990s. Mr Palmer faced a volatile media appearance on ABC's Lateline on Tuesday evening where host Emma Alberici disputed his claims over Aboriginal deaths and asylum seekers beng paid more than pensioners. Mr Palmer has accused the media of biased coverage against him, saying Rupert Murdoch had endorsed Tony Abbott and was running the country from New York. He said Mr Rudd had responded by bringing in US president Barack Obama's advisers to run his campaign. Mr Palmer said Mr Rudd had refused to debate him on the economy seven times. 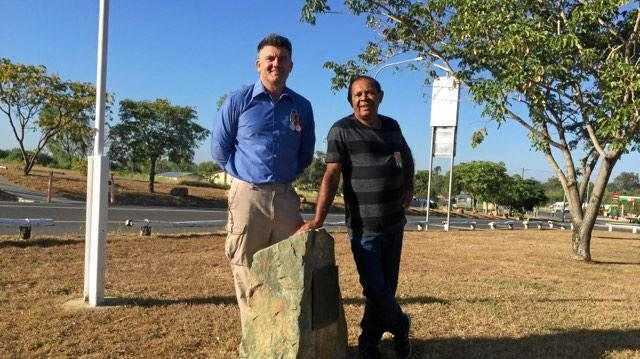 The Sunshine Coast resort owner has been on a brutal schedule, criss-crossing the country. Yesterday he did 10 interviews on radio and television in Sydney, kicking off at 8.30am and finishing at 9.30pm before flying back to Queensland. He created a social media frenzy when he won the endorsement of Sydney radio DJs Kyle Sandilands and Jackie O after he did a twerk. The gyrating billionaire appeared to lean heavily on the moves Miley Cyrus controversially performed at the MTV Video Music Awards on Sunday, forcing her dad, Billy Ray, to come out in her defence. Mr Palmer also popped into national young radio station Triple J. He also made an appearance on ABC-TV show The Hamster Wheel - scheduled to go to air tonight - where he delivered impersonations of Bob Katter, Kevin Rudd, Tony Abbott and Julia Gillard, before appealing for the vote of hamsters across the nation. In a none-too-subtle attack on Mr Rudd, he accused him of being more concerned about his hair flick than the people of Australia. In his 2Day FM hosts appearance, Mr Palmer declared Mr Rudd and Opposition Leader Tony Abbott were boring. The billionaire had not heard of the move but after an impromptu demonstration by Sandilands, he was more than happy to give it a go. Sandilands and Jackie O were more than impressed, saying he had just won the youth vote and their endorsement. Mr Palmer, who is flying the country in his $70 million jet to get his message out, said every Australian PM should be able to twerk. He joked that his wife Anna might even want to check his twerk style back home. Mr Palmer's Palmer United Party has 150 candidates across Australia. He has announced plans to cut tax by 15%, increase pensions and disability pensions by $150 a fortnight, cut the fringe benefit tax and stimulate the economy through a $70 billion injection.